Everybody has somewhere to be, and if you’re in a rush in the morning, an elevator in Salt Lake City might be what gets you there. Accessible elevators are for everyone, however, and it’s each person’s individual responsibility to act appropriately during the ride. Watch this video for an etiquette guide to the corporate elevator. An awkward elevator ride may seem harmless enough, but you can start your day on a more pleasant note by keeping things comfortable. First, don’t step onto the elevator until other passengers have had the chance to step off. Don’t stand too close to other passengers and encroach on their personal space, especially when the elevator is nowhere near capacity. If you are only going one floor up or down and there’s already a rush for the elevator, consider taking the stairs instead to free up some space for others. Elevators have made it possible for us to construct tall buildings that tower dozens of stories high. When you watch this video, you will learn all about how elevators work. The most common type of elevator that is found in today’s buildings is the rope elevator. This type of elevator uses a motor and pulley system to lift the elevator car up and down the shaft. A company that specializes in elevators serving Salt Lake City can provide you with more information about how your commercial elevator works. When you take the time to learn about how elevators work, you will be able to achieve a high standard of elevator maintenance. If you have started to notice that your elevator is not functioning as usual, you will want to set up elevator repairs right away. An elevator is a key feature for any corporate high rise building. 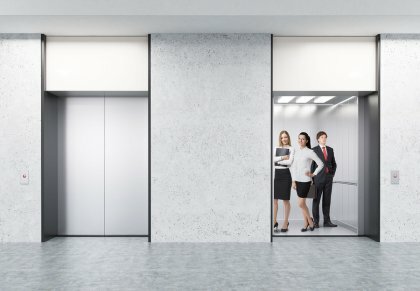 When you are planning on renovating your corporate headquarters, or are in the middle of a new construction project, it is very important to make sure that your elevator reflects the style and personality of your business. A commercial elevator company that specializes in installing elevators serving Salt Lake City will be able to work closely with you to choose an elevator that matches perfectly with your building’s architectural style. Let’s explore some tips for choosing the right design for your corporate elevator. Your elevator will be responsible for transporting your clients and workers between different floors and spaces in your building. During the busy morning and evening hours, the last thing that you will want to deal with is an elevator that is jammed with passengers. To make sure that your elevator is able to accommodate everyone who comes to your building, you will want to make sure that you choose a cab that offers the correct passenger size. As you are shopping for a new elevator system for your corporate building, you will also want to make sure that you choose a drive system that is able to perform to your standards. Modern elevators often contain winding drum drive systems, which are able to operate in more compact spaces. Other important components for your drive system include hydraulic brakes and efficient gears. When a potential corporate client enters your elevator for the first time, you will want to make sure that he or she is impressed with the style and elegance of your décor. To provide your elevator with a luxurious look, you may want to consider outfitting the cab with top of the line features, including premium wall finishes, mirrors, and stylish lighting. By taking the time to decorate your elevator cab, you can ensure that your elevator is a beautiful reflection of the quality of your corporate space.